Exclusive new research by the Centre for Evidence-Based Medicine shows a worrying lack of good evidence from trials to show these can improve the chances of having a baby. Panorama goes undercover to reveal how patients aren’t always told everything they need to know when they ask some clinics about these treatments. There have been concerns for some time that treatments offered in addition to IVF are expensive, do not improve outcomes and may actually be harmful. About a year ago, BBC Panorama approached us, wanting to know what IVF treatments are on offer; do they improve your chances of having a live baby; and what are the benefits when you take into account the harms? To answer these questions we reviewed 233 HFEA-registered NHS and private fertility clinics in the UK, and examined their websites for claims of benefits for additional IVF treatments. In total we found 74 unique fertility centre websites (many clinics share the same website), and examined 1,401 web-pages, finding 276 claims of benefit relating to 41 different interventions. Despite the vast amount of web pages and claims, we only found 16 published refs (cited 21 times) on 13 of the 74 websites, despite nearly a third of the claims (79 ,29%) quantifying the amount of benefit. The lack of published information meant it was not possible to use the websites to make an informed decision about the benefits and harms of treatments. The HONcode, which sets out the principles for trustworthy health sites, states that treatments should be supported by appropriate, balanced evidence. Yet, only four references were systematic reviews and two were conference abstracts – we were only able to locate one. Meanwhile, survey evidence shows couples regularly use the internet to improve their knowledge of fertility treatments and facilitate their decision‐making. Embryoscope (1 ref cited once on 1 website). Is this treatment recommended by NICE? If not, why? Has this treatment been subjected to ‘RCTs which show that it is effective and is there a ‘Cochrane review’ available? Are there any adverse effects or risks (known or potential) of the treatment? 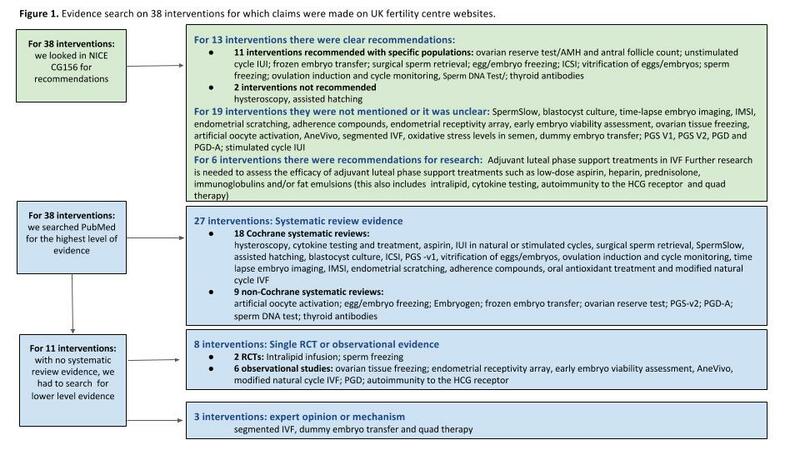 We created a list of 38 fertility interventions and searched for evidence (27 were classified by us as ‘Add-on’, 6 as alternative treatments and 5 used for preservation of fertility. Of the 38 interventions, NICE provides clear recommendations for 13 (34%). (11 recommended in specific populations and 2 interventions are not recommended: hysteroscopy and assisted hatching), and NICE recommends six interventions for research. Therefore for half of interventions currently offered at UK fertility clinics there is no mention in NICE guidance (CG156). For 27 of the 38 interventions (71%) we found systematic review evidence. Five reviews reported interventions that improved live birth outcomes: blastocyst culture, endometrial scratching, adherence compounds, oral antioxidants and intrauterine insemination (IUI) in a natural cycle. And one – Preimplantation Genetic Screening (PGS) – considerably worsened live birth outcomes. High dropout rates, poor randomisation methods meant evidence was low quality. Removal of low quality studies meant results were no longer statistically significant. Variable embryo transfer policies between groups, and differences in number of embryos available for freezing, further limited the conclusions. Some evidence endometrial injury on day of embryo transfer was harmful. Low participant numbers, and poor methods (5 studies both groups possibly received some degree of unintentional endometrial injury, and 3 studies were not published in full) meant the quality of the evidence was moderate. 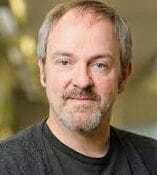 Removal of low quality studies, made no difference to effect estimate. review authors highlighted lack of information on harms. At present it is not known whether the intervention affects risk of miscarriage, multiple pregnancies, or vaginal bleeding. Ongoing UK multicentre RCT (ISRCTN23800982): starting in July 2016 – recruit 1,044 women aged < 37 undergoing IVF for 1st time; protocol includes data on harms including miscarriage and ectopic pregnancy rates. University of Sheffield CTRU NIHR UK) recruiting at NHS/private clinics as well. The comparison was between high and no hyaluronic acid or low hyaluronic acid. In 3 studies (n=324) that only assessed high versus no hyaluronic acid there was no significant effect. In some studies, multiple pregnancy rates were increased due to transferring more embryos per woman in the intervention groups. Significant effect on live birth rates (OR 4.21, 95% CI 2.08 to 8.51, n= 277 men). One study had inadequate methods (numbers of participants initially randomised to each group were not available). High unexplained dropout rates (26%) occurred. In one study PI had commercial agreement with manufacturer. The introduction of another intervention component (natural vs. stimulated) meant this effect was confounded; for 3 other comparisons of IUI in the same review there was no significant effect on live birth rates. Pre-implantation genetic screening (PGS) 9 trials, lowered live birth rate. Absolute decrease in t live births of 147 per 1000 women treated. In one trial delivery rates per cycle were higher in intervention group however, in pooled analysis including identified cohort studies, no significant effect. For 11 interventions, we were unable to find systematic review evidence. As an example, for Intralipid we found one randomised controlled trial that was not published three years after completion (see trials.gov entry), and was published as a 300 word conference abstract. Despite the numerous problems with using an abstract, the lack of blinding, and a host of other issues, the results in the abstract were statistically wrong. This meant we had no way of verifying them, and prevented us from including it in our analysis. 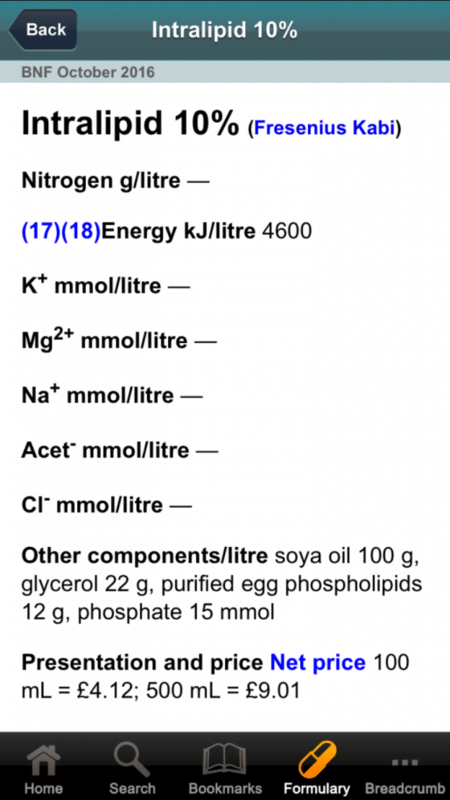 This treatment can cost up to £300, in some clinics; Yet, the cost in the BNF is as little as £9.01 for 500mL of Intralipid 10%, which would make it a cheap intervention if there as robust evidence of effectiveness. Furthermore, all of the Cochrane reviews reported very limited information on harms, making it impossible to inform couples about the harms.